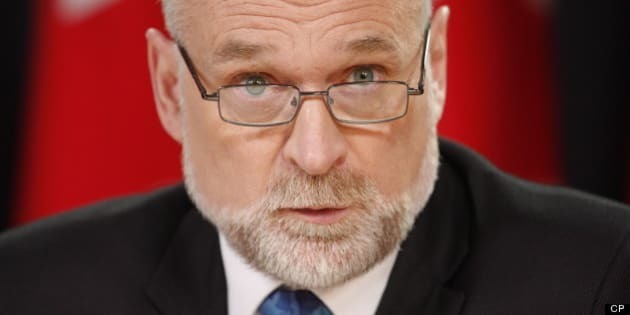 Michael Ferguson was in the media spotlight when he began his job as Canada&apos;s auditor general two years ago amid controversy and protest from opposition parties over his lack of proficiency in French. Although bilingualism was a requirement for the job, the federal government appointed Ferguson despite his lack of French. Ferguson vowed to be proficient in French within a year, but two years into the job he concedes his French has improved but he&apos;s still a ways away from being fluently bilingual. "At this point, I still have work to do," Ferguson told CBC News in a year-end interview on Dec.18, 2013. To show that he is bilingual, Ferguson must pass a reading, writing and an oral test. So far, he has passed the written exam only. It&apos;s the oral test that will prove the most challenging. "On the spoken, I&apos;m probably not at the level required yet," Ferguson said. That&apos;s why his French teachers go over his public statements with him on a weekly basis looking for grammar mistakes. "It&apos;s a good way for me to learn and improve my level of French," he said. Sylvie Dauphinais, one of his French teachers, tells him it&apos;s important to make mistakes. "You&apos;re more likely to remember the word in question after you&apos;ve made a mistake," she tells Ferguson. In addition to taking French classes, Ferguson listens to French radio on the drive in to work and the drive back home every day. He has also enjoyed reading Les Jeux Sont Faits, a novel written in 1943 by the French philosopher Jean-Paul Sartre, which was later turned into a screenplay. "It was surprisingly easy to read," he said. Ferguson said he will continue taking French lessons. "I&apos;ll carry on with it for the rest of my mandate, because it&apos;s something you have to continue to work at." Ferguson was the first unilingual auditor general the government hired in the last 20 years, since Kenneth Dye was in the post. He will also be the last. Since Ferguson&apos;s appointment, the government passed an NDP private member&apos;s bill in June calling on all agents of Parliament to be bilingual. The Languages Skills Act now requires that the auditor general "be able to speak and understand clearly both official languages, at the time of his or her appointment." Notwithstanding the challenges that come from learning a second language later in life, Ferguson is not in uncharted territory. Prior to his appointment in Ottawa, he served as auditor general of New Brunswick from 2005 to 2010 and then as that province&apos;s deputy finance minister from 2010 to 2011. "The work as auditor general of Canada is very similar to the work I did as auditor general in New Brunswick," Ferguson said. "More zeros at the end of the numbers. Bigger staff." Ferguson and his team of auditors will spend the next year and a half going over with a fine tooth comb the expense claims for the last two years of all sitting senators. "We are auditing the expenses of all of the senators and we&apos;ll continue away at that," he said. Ferguson said his office is also prepared to look at the expenses of members of Parliament — if asked. "We feel there&apos;s a role that we could play there and we&apos;re quite prepared to," he said. But so far, no such request has been made to his office. In November, Ferguson stressed to a House of Commons committee the need for independent oversight of expenses claimed by MPs&apos; expenses. "I think what the committee has essentially come down to now is to say that they will look at what role we might play as the Office of the Auditor General, but they haven&apos;t defined any specific mandate for us." While some MPs do post some or all of their expenses online, Ferguson said he has recommended that they go further. "What really matters is how the average Canadian feels about whether they have the information they need about the expenses of members of Parliament," he said. "Hopefully, at the end of the day, they are going to be disclosing enough information that people will say &apos;OK, yes, I have enough information that I can understand that.&apos;"
Ferguson will not be auditing the expense claims of suspended senators Patrick Brazeau, Mike Duffy and Pamela, or claims made by retired senator Mac Harb, all of whom are under investigation by the RCMP.